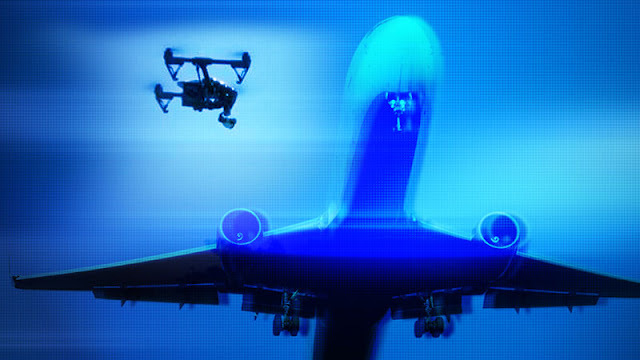 LONDON >> Three airliners narrowly missed colliding with drones near London’s Heathrow Airport in the space of three weeks last year, underscoring increasing concerns about the devices near aircraft, a report today said. The report by the U.K. Airprox Board, which catalogs air safety incidents, offered new details on the close calls that took place in October and November. In the most unusual incident, the pilots of an A320 passenger plane descending into Heathrow noticed a gadget with multiple arms and rotors passing below the plane’s right wing at 10,000 feet. The separation between drone and plane was just 100 feet vertically and 656 feet horizontally. The pilot said there was no time to react, the report said. While actual collisions are rare, the number of near-misses has increased dramatically in recent years as the popularity of drones has grown. There were 70 near misses between objects identified as drones and aircraft in 2016, compared to 29 in 2015 and six in 2014, the board said. It was one of three near-misses involving planes near Heathrow in the February report. In the other two cases, the board said it was either good luck or divine providence that had spared a serious accident. Drones must not be flown above 400 feet in Britain. Owners must be able to see them at all times and avoid planes, helicopters, airports and airfields.